I am not quite sure how to tag this series in genre terms. In many ways it’s paranormal urban fantasy, except the urban environment is Barcelona and the year is 1931, on the eve of the Spanish Civil War. 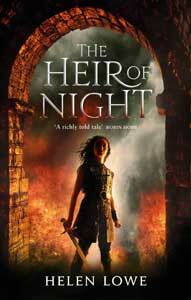 So in that sense it’s historical fantasy, where Spain’s descent into Civil War forms the backdrop to a conflict between angels and demons in which the nephilim — the hybrid offspring of human pairings with the supernatural beings — serve as foot soldiers in the war between the higher powers. Are you already fascinated? 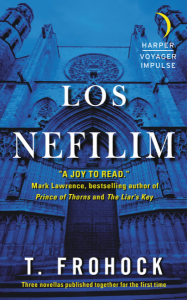 Well, I can only say that if you like urban fantasy’s juxtaposition of the real and the paranormal, or the interweaving of real history with a parallel fantastic story, then I suspect you will enjoy Los Nefilim. Similar kinds of tale-spinning, although otherwise very different stories, would include Constantine and the Sookie Stackhouse novels. (That’s True Blood, for all those who have only seen the TV series.) Not to mention Teresa’s own Miserere, which you may recall that I really enjoyed, awa’ back in 2013. For me, there is more than a little dash of detective/thriller noir in the storytelling mix as well, perhaps derived from the 1930s era, perhaps from the urban setting, perhaps simply from the kind of mystery-action-supernatural story Teresa has chosen to tell. Yet for whatever reasons, the mix of storytelling influences worked for me. 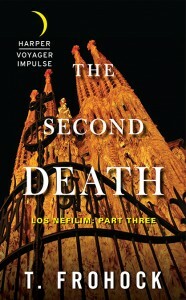 In the three sequential stories that comprise Los Nefilim, Diego Alvarez, his son Rafael, and lover Miquel, are — like Barcelona in 1931 —caught up in a brewing war: not between the angels and demons, as might have been expected, but a civil war between different factions within the angel ranks. A subtext is that the leader of Los Nefilim, Guillermo, is trying to secure their independence in the strife about to break loose. The thing that I most enjoyed was Teresa’s deft interweaving of the historical setting and the paranormal conflict and mystery to be resolved, with the very personal stories of Diego, Rafael, and Miquel, but also Guillermo. Because as the story unfolds, the reader realises that the nefilim are also reincarnated souls and that characters such as Diego and Guillermo have a past-lives backstory. Los Nefilim is also an intergenerational story, with Diego’s relationship with his father, as well as with his own son, Rafael, forming the heart of the linked tale. However, another aspect of the three novellas that I really enjoyed was their accessibility. I read each novella in one to two sessions and although collectively they added up to a short novel, individually I didn’t feel I was having to make the same reading commitment as I would have if I’d picked up a typical epic fantasy, for example. The “down” side of this was that when I got to the end of each novella I always wanted moar. In this sense, I suppose, a novella is like nouvelle cuisine — delicious but you may still be hungry at the end of it, which is fine so long as the next novella is there to be read… However, it is very satisfying to be able to actually finish a story even if I still very much wanted more Los Nefilim at the end of the concluding novella, The Second Death. Another strong aspect of Teresa’s storytelling is that she managed to make the characters real and engaging despite the limited scope, word count-wise, of a novella. She also managed to integrate a considerable cast of characters, making them all seem well-drawn and credible, even if the main character was unquestionably Diego. His secondary relationships with Rafael, his newly discovered son, and friendship with Guillermo, the leader of Barcelona’s nefilim, both evolved through the three novellas, providing additional depth. So if you’re looking for a well-written, historical-urban-paranormal fantasy that deftly traverses both supernatural and human story elements and is character driven, then the three stories that comprise Los Nefilim may well be for you. 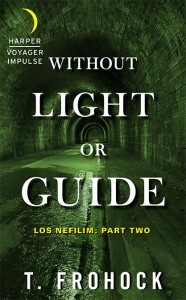 Being novellas, they also add up to a relatively easy read, which is a potential bonus for busy readers. The Los Nefilim novella are available in e-format now; the collected paperback edition will be out in mid-June and is now available for preorder. Teresa Frohock is a friend.